Some of our clients websites. Each website has been chosen to demonstrate unique design aspects and different features that have been used to attract their target audience. 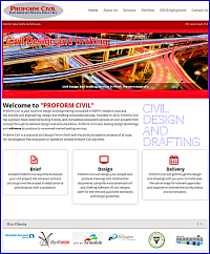 Profom Civil is a civil engineering design and drafting firm, based in Mundaring - Perth. 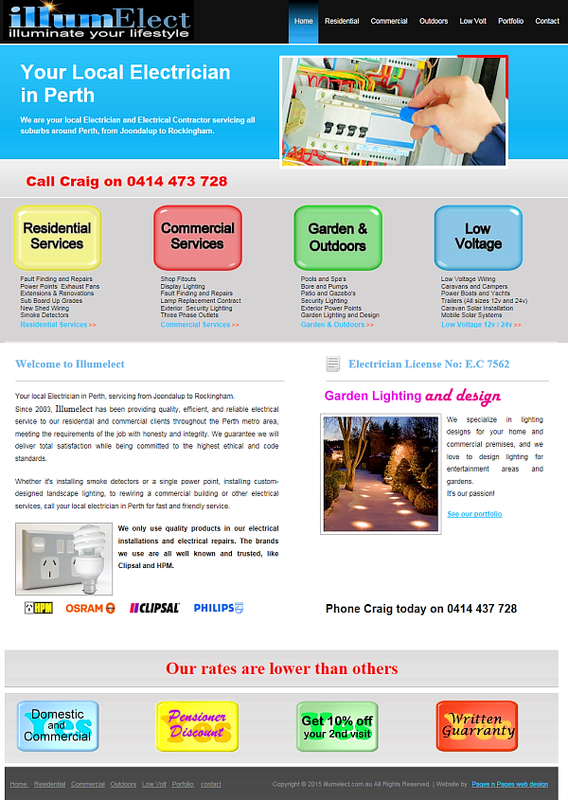 Dale needed a website to promote his business to a particular client base. 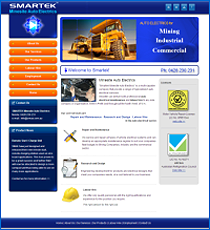 Government departments, shire councils, commercial and industry sectors, and even mining companies. The style and layout of the website was designed to appeal to professional people that would be searching for a civil design company. Dale and I worked very closely on all aspects of the design, and the content, of the site to accomplish this. The site started out as a 6 to 7 page website but after we suggested to include some of the CAD Drawings it soon grew to a 21 page site, especially when Dale realised, extra pages weren't going to cost that much more. 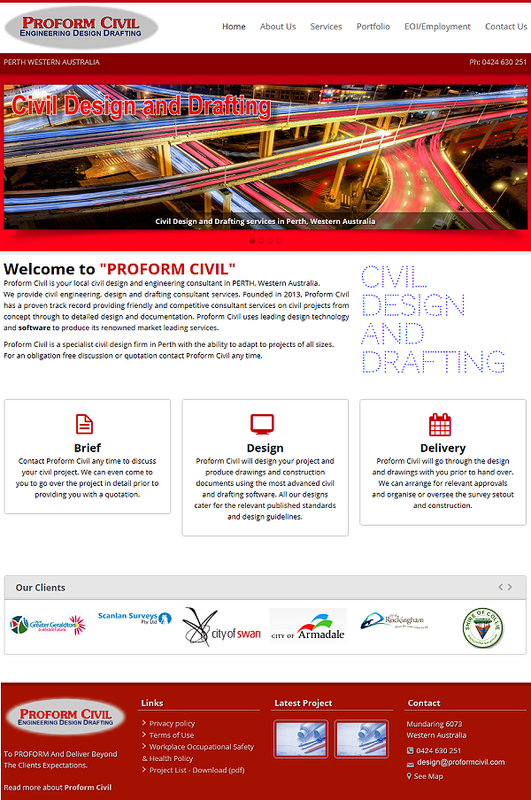 Three Splash Boxes are used on the Home Page, to quickly convey what Proform Civil can do and below that, is an Auto Scroller with their previous clients logo's. An important inclusion that instils confidence in the viewer. One of the most important design features is being a RESPONSIVE LAYOUT website. Meaning it can be viewed on any size screen, from mobile phones to palm tops and office PC's. "Google" now recognizes Responsive Websites, which helps to rank them higher in search results. FEATURES: 21 Pages, Responsive Design, Dropdown Menu, Dynamic Photo Gallery, Tab Widgets, Header Slider, 2x Contact Forms, PDF Downloads, Google Map, Artwork. 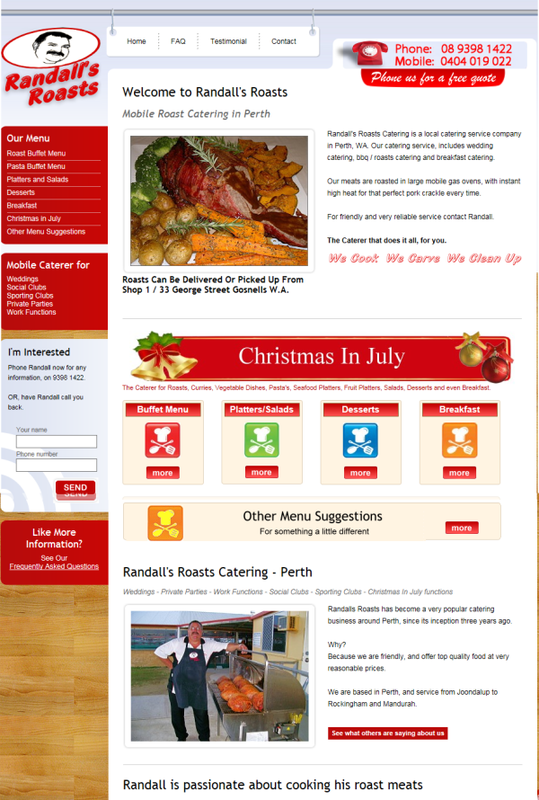 Randall's Roasts is a family business offering mobile roast catering to the Perth metropolitan area. Randall decided his website needed to be a little different than the other catering websites. They had their logo too, so the site needed to stay in line and match the same style and colours. The design we came up with was to give a feeling of home cooking and to portray that Randall's Roasts prices are affordable. This was accomplished with a blue sky, timber background, pots and pans and a checkered table cloth. Obviously, the food is most important and it was decided to give this section a lot of detail with photos. To compliment this, Menus were developed so viewers can download these and print them out, allowing them to discuss with family, friends or work colleges, which menu to choose. A feature not seen on any other catering sites around Perth at the time. Information was also very important to help viewers choose Randall's Roasts. A Testimonials page and a Frequently Asked Questions page are included to give as much information as possible. 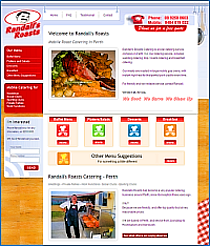 Pages n Pages also arranged the Domain Name registration and Hosting for Randall's Roasts. FEATURES: 11 Pages, 2 Seperate Page Menu's, Sourced Photos, Artwork, Callback Form, Contact Form, Ticker-tape Widget and all Menus can be downloaded in PDF format. 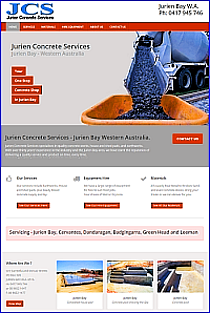 Pages n Pages was asked to build another website by one of our previous clients, for their newly aquired business, Jurien Concrete Services . All communications while building their website was through e-mails and telephone conversations. A main feature of this website, to grab the viewers attention, is the Fancy Header on the home page. Together, with sliding pictures and words appearing from all directions, the message is hard to miss. Six pages were enough to accomplish what they needed and to get their massage out to attract new customers. However, Jurien Bay, just north of Perth, has a small population, so they needed to attract customers from surrounding areas and other townships. One way to do this was to state in large headings the names of the areas serviced and Search Engine Optimisation. Three pages were used to show the services they supply, "Concrete Supply and Lay", "Equipment Hire" and "Material Supplies". Because not a great amount of text was needed, Photos that enlarge when clicked on were used to enhance information. 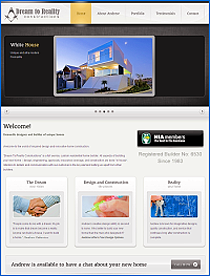 This website is a Responsive Design website so it can be viewed on any size screen, like Mobile Phones and Palm Tops. 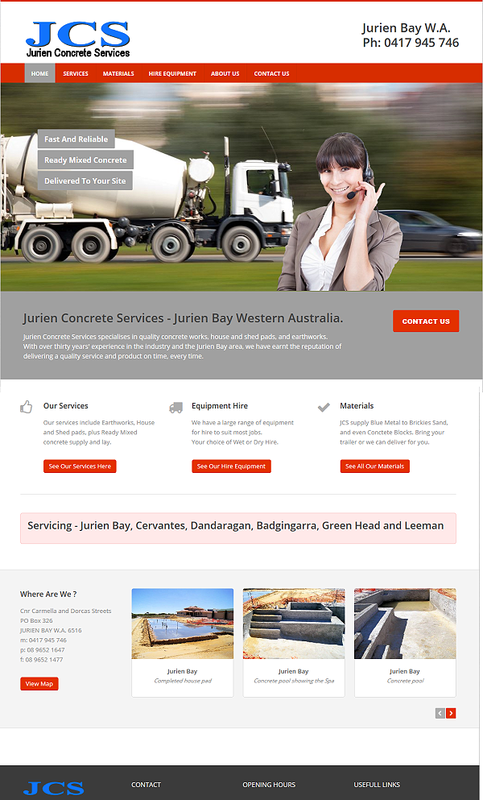 Pages n Pages also arranged the Domain Name registration and Hosting for Jurien Concrete Services. FEATURES: 6 Pages, Responsive Design, Fancy Header, Artwork, Enlarging Photos, Logo, Google Map, Contact Form. 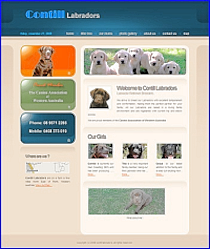 Dog breeders, "Contill Labradors" are located on a farm just out of Perth WA. All communication with our client was by e-mail and telephone. As their website was constructed we e-mailed our client so they could view the changes. This allowed our client to give feedback on aspects of the design and content, and makes for greater collaboration between us and the client. The whole site has a soft feel in keeping with the product; little puppies. When new puppies arrive, the photos are e-mailed to us and are posted on the web site. The client and I have have great comments about this web site. 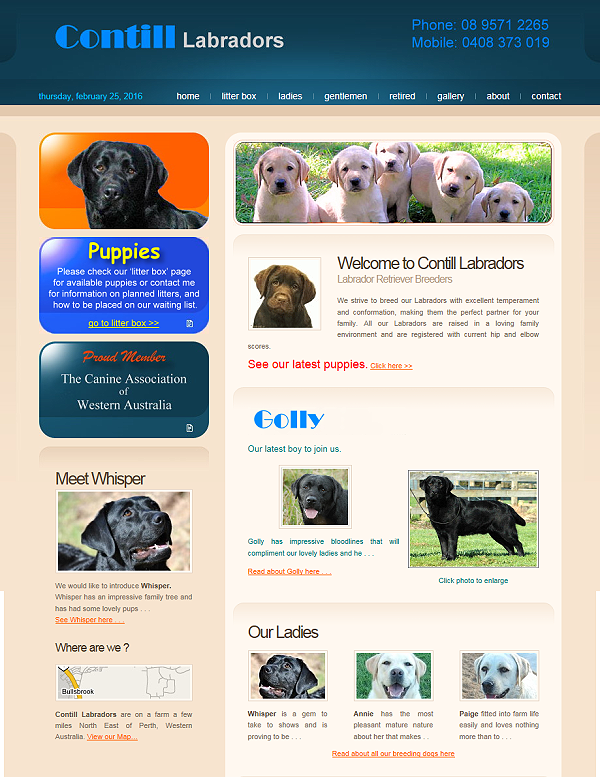 Not long after Contill Labradors started, Bridgitte the owner, decided to add two extra pages. Pages n Pages registered the Domain Name and set up the hosting for the web site. FEATURES: 8 Pages, Artwork, Photo Gallery, Enlaging Photos and Contact Form. 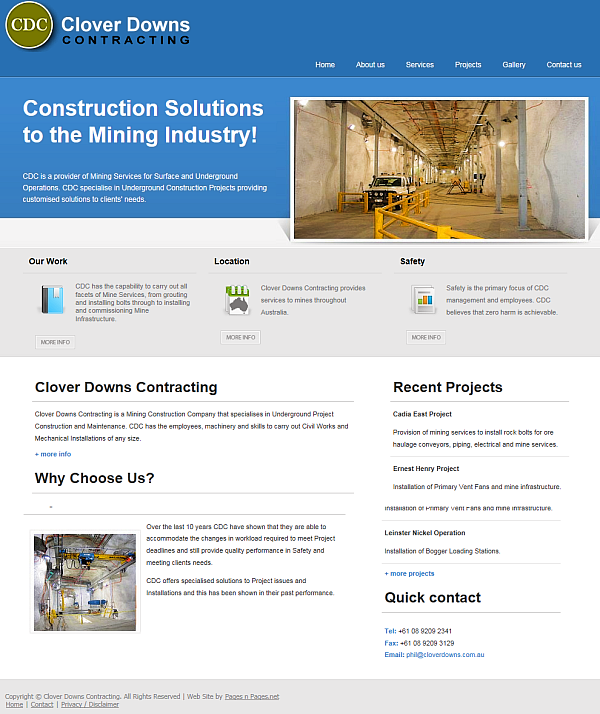 Clover Downs Contracting is a Mining Construction Company that specialises in Underground Project Construction and Maintenance. 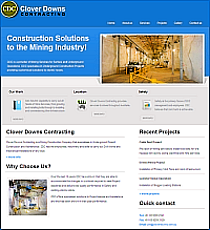 They had a website for some time, but realised they needed to up grade it to show all their services, and to moderise it to appeal to mining companies and the corporate sector. From the ideas they described, two draft copies were shown to Clover Downs. Then together, we worked on the chosen site. Our client e-mailed their photos and all the text to us, while Pages n Pages worked on the layout and Artwork. The end result was a very clean and crisp website, just what they were after. They had a lot to say, because of their services, previous contracts and expertise. These were neatly displayed on an About Us page, a Services page, a Projects page and a Gallery page. The majority of photos were limited to a Photo Scroller on the Home page, and a dedicated Gallery page. This was in keeping with a corporate/whitepaper feel. FEATURES: Fixed Width Layout, Photo Scroller, Photo Gallery, Artwork, Sourced Photos, Contact form. Stylish and Unique, describes Dream to Reality Constructions homes. 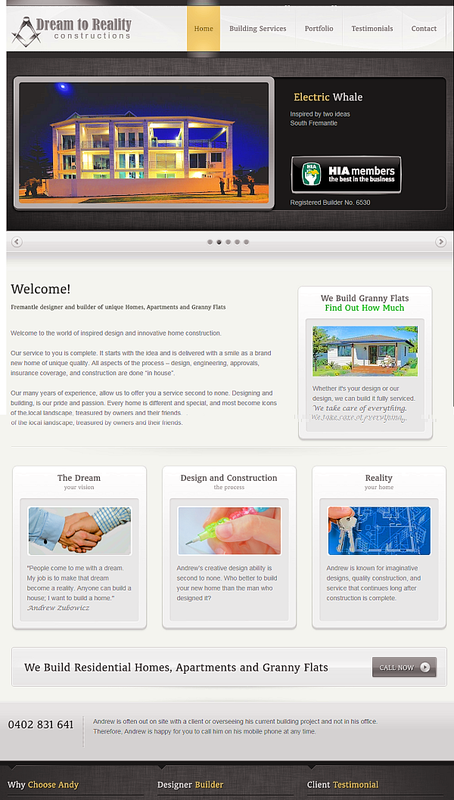 And that was the brief Pages n Pages was given, when designing the Dream To Reality website. This website needed to match the product, and the design, layout and graphics of this site does just that, right down to the Fonts used. Colour was kept to a minimum to enhance the photos of their homes, and extensive use of HD Photo Galleries were used to show them off. House photos were taken by a professional photographer. Fading photos on the Home Page are used to get the attention of the viewer and three Splash Boxes are used to explain what this company does as soon as they arrive at the website. Andy's company has grown lately and so has his services. Two more pages have been added and the main menu has been modified to a DROP DOWN styte to accomodated the extra pages. FEATURES: 12 Pages, High Quality Photo Galleries, Contact Form, Artwork, Dropdown Menu. 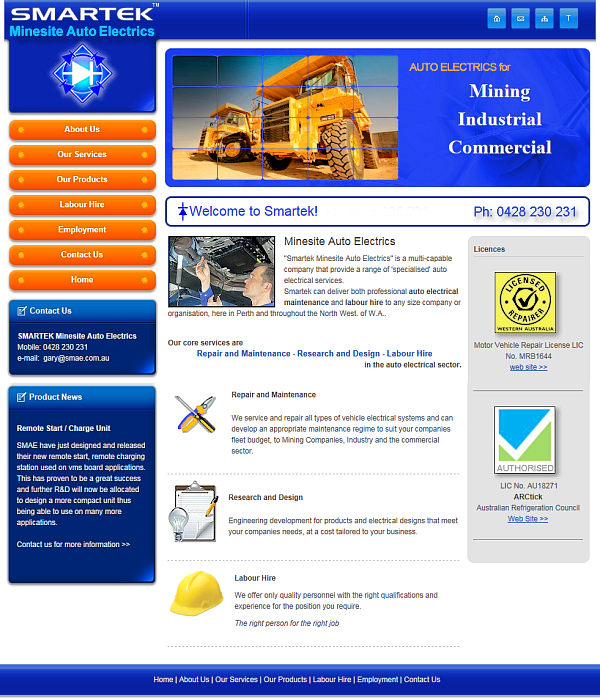 Smartek needed a web site to target a particular clientele. Mining and Construction. They also wanted a web site to be a little different than the other sites that were in the same field as they were. After consaltation and many e-mails back and forth, a design was chosen for it's bright colours, and 3D look, yet still retain a professional look and feel. Smartek's three core services were displayed on the Home Page, for quick information about what services they offer, as well as License and Accreditation logos, which are important for this trade. Other additions are Product News and Resent Project boxes, an Employment Form and a Secure Area for Smartek employees, for their technical data. On the Services page, all Smartek services are in a list format with a description, to convey information to the viewer quickly and precisely. FEATURES: Two Flash Animations - Two Contact Forms - Fixed Width - 3D Layout - Custom Artwork - Password Secure Area - Information Boxes - Rollover Menu. "Illum Elect" electrical services use to advertise in the local paper and Local directories and found the cost to be expensive. Craig, the owner liked the first draft copy of the Home Page and with a few adjustments formed the theme of the rest of the site. Although "Illum Elect" has 4 main service areas - Garden and Outdoors, Low Voltage, Residential and Commercial Electrical Services, Craigs passion was in Lighting. Pages n Pages designed the Logo, the Spash Boxes and the Coloured Buttons to be bright, 3D and to be glass like. The viewer, arriving at the Home Page, can't miss the 4 main services, and each button links to a dedicated service page. 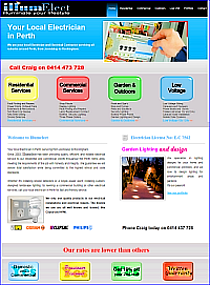 The Splash Boxes are positioned on 6 of the 7 pages to show prospective customers the advantage of using Illum Elects services. Extensive artwork was employed throughout this website, using state of the art software, to stand out and catch the viewers attention. This website was a full package - Logo Design, Website Construction, Domain Name Registration, Hosting Account set-up. FEATURES: 7 Pages - Custom 3D Artwork - Logo Design - Photo Scroller - Animated Links - Splash Boxes - Rollover Menu - Contact Form. Southwest Artificial Lawn, as the Domain Name says, supplies and installs artificial or synthetic lawn. Jason, the owner, didn't have a particuly look in mind for a website, howerver he did want the colour green to be included. We came up with shades of green and purple, which he loved. 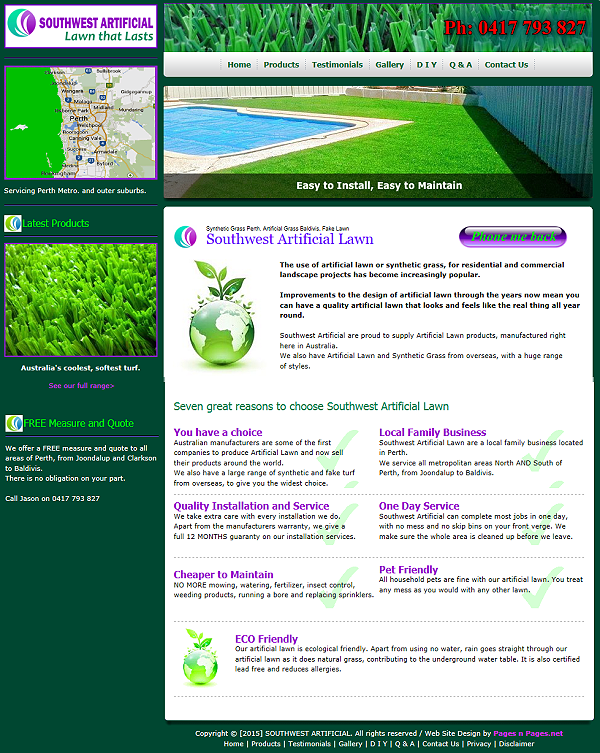 The first thing a visitor sees on the Home page is a Flash Animation of lawns, a map showing service areas, close-up photos of blades of grass and the heading "Southwest Artificial Lawn". These 4 things show the visitor exactly what this website does and location within the first few seconds of arriving at the website. On 6 of the 7 pages is a 3D "call to action" button, called Phone Me Back, which takes the visitor to a Call Me Back contact form. Jason can then phone them at the time they have requested, plus he knows they really want to talk to him. Other pages are a Product Page, Testimonials Page, Scrolling Photo Gallery, a DIY Page with diagrams, Contact Page and a Questions and Answers Page. Artificial or Synthetic Lawn/Grass is still not widly used and is still relativly new. Because of this Pages n Pages stongly suggested to include a Q and A page. This answers most questions people have and is appreciated by prospective clients or customers. A helpful business is more likly to get customers and sales. This website was a full package too - Logo Design, Website Construction, Domain Name Registration, Hosting Account and E-mail set-up. FEATURES: 7 Pages, Flash Animation on 5 Pages, Call Back Contact Form, General Contact Form, Sourced Photos, Photo Gallery, Custom Artwork. 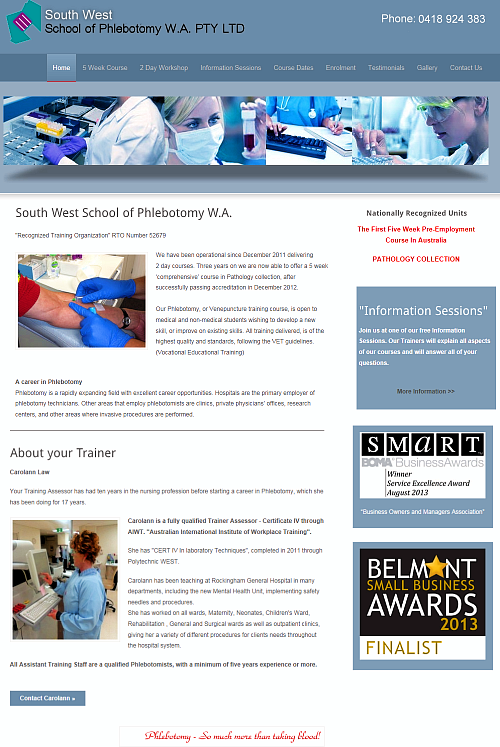 Southwest School of Phlebotomy started back in 2011, teaching Venepuncture and Phlebotomy. Cassie pretty well left the look and design up to Pages n Pages, but wrote up all the text for the website. The Header photo at the top of each page is designed to show what enviroment students will be working in. Being a registered training company (RTO), all written information needed to be exact and correct for their Govenment Accreditation. Because the company was in the medical field, sutble shades of grey were used through out, for a clinical and authoritive feel. Detailed Class Dates are displayed on two pages and information for students on a third, which is also available to download to print out. When class dates change, Cassie just e-mails them through and the new changes uploaded with in a couple of days. This website was a full package, Domain Name registration, Hosting Account, E-mail Accounts and Website were all handled by Pages n Pages. Oh! and Venepuncture and Phlebotomy is the taking of blood. FEATURES: Nine pages - Enrollment Form - Contact Form - Sourced Photos - Information Boxes - pdf Downloads. 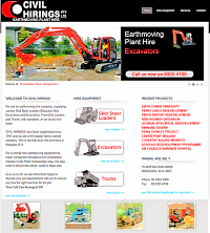 Civil Hirings are a earthmoving equipment, hire company, and wanted to target construction companies AND the private sector. They already had a Domain Name and a Hosting account set up. Only four pages were used to get their message across; That they're a family business - To display their hire equipment - The services they provide - and their contact information and location. 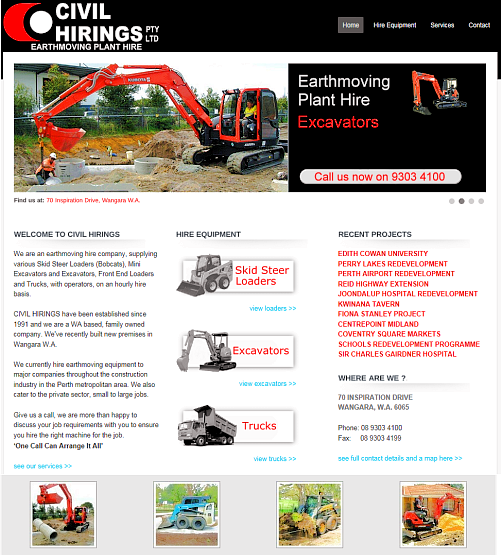 One page was use to display all of their hire equipment, rather than switching to different pages for certain equipment. The Header on the home page rotates photos of equipment, and thumb nail photos along the bottom are used to display equipment in action. Services Offered, Resent Projects and Areas of Operation, using a map, are all displayed on the Services Page, to utilise space economically. An interactive Google map on the Contact Page is used to help with location of their premises, and the ability to download documents like a Credit Application and Contractor Details, also help with this compact web site. Even though this site has only four pages, it shows not all businusses need a large website. FEATURES: Four Pages - Rotating Photo Header - Custom Artwork - Animated Links - Interactive Google Map - Downloadable Documents.